A man who fathered a child for a lesbian couple has confronted a group protesting over Dawn Primarolo's role in the Human Embryology and IVF Bill. 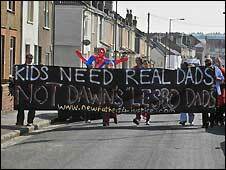 The break-away New Fathers 4 Justice group held their first protest march near her Bristol constituency office. The group claim the health minister's support for the Bill signalled a dismissal of the need for a male role-model in a family. A neighbour said he was proud to have provided sperm for lesbian friends. A Department of Health spokeswoman said it "fully recognised the role fathers play in their children's lives". She added: "In the current law as it stands, the law refers to the need for a father, and we are replacing this with the need for supportive parenting. "Research evidence shows that it is quality parenting that counts, rather than gender. "We are not doing away with fathers, we are valuing all parents." Unfortunately for the 10-strong protest group, the health minister had left her office in Chessel Street 20 minutes before they arrived. The noisy demonstration brought residents from their homes. Several angrily confronted the group. One man, who did not want to be named, questioned the F4J's attitude and revealed he had been a sperm donor for two lesbian friends whose baby was born six months ago. He told the protesters he was "very proud to have facilitated two mothers to have a child". When the Embryology Bill was debated in May, Mrs Primarolo, in response to shadow health minister's Mark Simmonds demand for "male role models", said "that would create an additional hurdle" for lesbian couples and single women.